Selectable voltage "laptop" style power supplies 90 watt, 120 watt and 120 watt AC Switchmode power supplies, with user adjustable output 12V, 15V, 16V, 18V, 20V, 21V, 22V or 24V. Universal AC adjustable output DC power supply, 90 Watts, and 120 watts. These are small switchmode power supplies, with adjustable voltage output, 90 watts to 120 watts peak. Suitable for laptops, LCD monitors and other electronics. International adapters The AC input is a 2 prong IEC C8 socket (which takes the C7 plug) that will fit a variety of international cords. The USA cord is included. The AC input is a 2 prong IEC C8 socket. The USA cord is included. The DC input is a 5.5x2.1mm barrel, a cigarette lighter plug adapter cord is provided The AC input is a 2 prong IEC C8 socket (which takes the C7 plug) that will fit a variety of international cords. The USA cord is included. 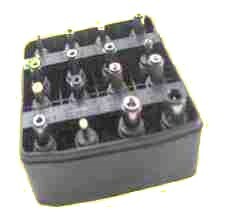 16 connector set available extra, click here for details. How Many Amps are Too Many? In a regulated power supply, such as these switchmode power supplies, amps don't matter as long as you have enough. Excess amperage is just held in reserve. An analogy is "doubling the size of your water heater won't make your shower pressure change." Unregulated power supplies (such as wall-mount transformers) are different, since they are built to supply a specific voltage at a specific amperage. If you draw less amperage the voltage will go up. In conclusion, a higher current rating won't hurt your appliance as long it is a regulated power supply. For unregulated power supplies the specification should be close to the original. I recently purchased this power supply from you, and I wanted to let you know it was just what I wanted. I use it to power accessories around a model railroad, and it is doing that job very well. I just posted a recommendation for this product on a Yahoo user group, and I would not hesitate to recommend the PST-YD100W to anyone looking for a compact reliable power source. 12 volt, 15 volt, 16 volt, 18 volt, 19 volt, 20 volt, 21, 22, 24 volt 90 watt power supply, 12 volt DC power supply.